The waterfall is undoubtedly the most beautiful and favored feature in a water garden. If space is limited in your yard or you have safety concerns with a pond, why not build a Pondless® or disappearing waterfall? The name basically explains it all. It's a waterfall and stream, without the pond. So why would you want a waterfall without a pond? 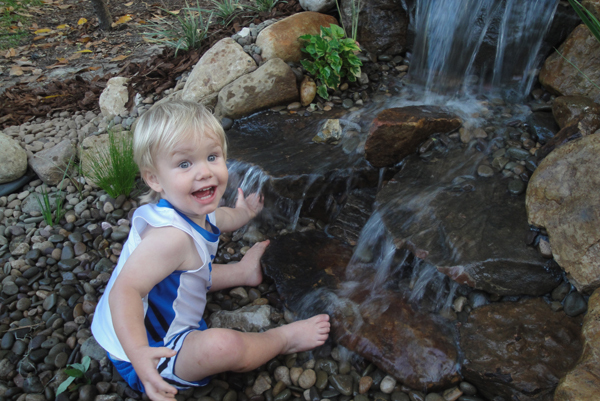 Because there is no pool of water, a Pondless® Waterfall is a great option for small children that want to play and splash in the water without the concern of safety. Cost can be a big factor when considering the type of water feature you want to build. In most cases, the price of a Pondless® Waterfall will be less than a pond, as it often requires less rock and materials. The small size of the Pondless® Waterfall means you can build and enjoy a beautiful waterfall anywhere in your yard. Taking care of your Pondless® Waterfall is easy. Filling the reservoir every few weeks to compensate for water loss due to evaporation is all that is required. The Aquascape Pondless® Waterfall has made many water-lovers who were previously unable to indulge in the sweet sounds of falling water, very happy. It's a great alternative for those who are trying to get their feet wet, or looking to fit a little bit of paradise into their own backyard. being clogged and reduces pump maintenance.